China's anti-splitism bureaucracy is up in arms. This time the Chinese Communist Party bureaucracy's fight against separatists is turning against scholars within party think tanks who dare to suggest accommodation and reconciliation with the Dalai Lama is needed for when the time comes to identify his reincarnation. This is not a bureaucratic turf war. It is a frontal assault with big guns firing. Both at home and abroad in shrill, "don't talk back" tones, the anti-splitism bureaucracy is engaged in a largely one-sided shouting match. On 22 October, the Information Office of the State Council, China's cabinet, released another white paper on the development and progress of Tibet. The message like all other incarnations of the white paper before it, is the same. Old Tibet suffered under feudal serfdom and theocracy. New Tibet, the white paper claims, has "gained freedom, equality and dignity" and is "fully enjoying the fruits of modern civilization". However, there is a little problem. The latest white paper complains, "The 14th Dalai Lama and his clique in exile are conducting separatist activities for a long time to sabotage the development and stability of Tibet ... They have put forward the so-called concepts of Greater Tibet and high degree of autonomy, which in fact go against China's actual conditions, and violate the constitution and relevant laws." The party journal Qiushi ("Seeking Truth") in its 21st edition of 2013 carried a lengthy article by Chen Quanguo, Tibet's party secretary, who called for more restrictive measures to stop the flow of all online information between Tibet and the outside world. Barely able to combat the influence of the Dalai Lama in Tibet, Chen Quanguo sets himself a lofty goal in his anti-Dalai Lama struggle. He said, "We should educate and guide cadres and ordinary people of various ethnic groups to separate Tibetan Buddhism from the fourteenth Dalai Lama and separate the fourteenth Dalai Lama from the title of the Dalai Lama so that they will consciously make a clear break from the fourteenth Dalai Lama's clique." Separating Tibetan Buddhism from the 14th Dalai Lama is, even for the Communist Party, a tall order. However, trying to de-link the 14th Dalai Lama from the post of the Dalai Lama seems to be the depth of desperation of China's anti-Dalai Lama bureaucracy. It is like trying to separate the Pope from Catholicism. The work of the anti-Dalai Lama bureaucracy like trying to separate Mao from Maoism or, saying Mao is not Mao. For those who wish the Chinese Communist Party well, they can only say best of luck in its new spiritual quest. But discerning Buddhists around the world - and there are plenty in China - see that behind the Tibet party secretary's spiritual goals lies a dark ulterior motive: a life-and-death struggle against the Tibetan spiritual leader. Chen's diatribe and other missives are aimed at China's domestic audience. Explaining China's current hardline policy on Tibet to the rest of the world is left to Zhu Weiqun, China's principal interlocutor with the envoys of the Dalai Lama from 2002 to 2010. During his trip to Europe in October, Zhu, the director of China's ethnic and religious affairs, gave a series of interviews to the media. These interviews have subsequently been reprinted in China's domestic media. In one, he said the only purpose of the meetings between the two envoys of the Dalai Lama and the Chinese authorities was to "persuade the Dalai Lama to stop separatist activities ... and arguing for the so-called Tibet issue". 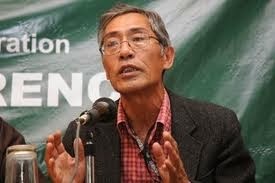 Zhu Weiqun said, "The fact is that the fate and future of Tibet are in the hands of the Chinese." If the party is so confident it has the right medication for its Tibet headache, why doesn't it go about doing it silently? Why all this noise? One reason is the ongoing spate of self-immolations that are engulfing the plateau. Kunchok Tseten, a father of two, was the latest Tibetan to set himself on fire on December 3 in Ngaba in Sichuan province, where most self-immolations have taken place. This brings the count of those who set themselves on fire on the Tibetan plateau to 123 since February 2009. All had called for the return of the Dalai Lama to his homeland and freedom in Tibet. Against this background of fiery protests, the party needs to explain if its policies in Tibet are so correct why is the issue ablaze? In this case and in other cases of anything going wrong in Tibet, the party's accusing finger is pointed at the Dalai Lama's clique. This easy way of absolving responsibilities for failed Tibet policies carries weight and conviction with China's online public. The party's propaganda that it is the Dalai Lama who is forcing these young Tibetans to self-immolate have provoked some on Weibo, Chinese Twitter, to ask, why doesn't the Dalai Lama self-immolate? It is easy for the party to hide its failed policies on the plateau behind the smokescreen of Chinese nationalism. It is also easy for a well-funded bureaucracy to blast Tibetans who only ask to be treated decently with the full force of Chinese nationalism and drown their already silenced voices in the din of official rhetoric. The hard part is how to respond to those within the party who call for a change of tack on Tibet. What makes officials who handle the party's Tibet policy nervous are suggestions expressed within the party establishment for China to adopt a more accommodating attitude to the Dalai Lama. Suggestions for change in policy, expressed in scattered interviews, might become a clamour and then transform itself into a trend. There are reports that this sentiment enjoys widespread support within the party's intellectual circle. A significant salvo against the party's hardline policy on Tibet was fired by Jin Wei, a professor at the Central Party School in Beijing. This June and October in comments made to Asia Weekly, a Chinese language publication in Hong Kong, Jin Wei said that treating the Dalai Lama as an "enemy" alienates all six million Tibetans who believe him to be the "living Buddha". She said, "The Dalai Lama is the key to the issue of Tibet." Professor Jin Wei's idea in re-establishing contacts with the Dalai Lama is to gain his co-operation in identifying his successor to enable Beijing to install a Dalai Lama of its choice to stabilize its rule on the plateau and avoid the embarrassment of two Dalai Lamas. For Chinese policy makers who are trying to find alternative policy choices to resolve the issue of Tibet in the most cost-effective manner, Jin Wei's suggestions may look attractive, even tempting. But such suggestions send the party's anti-splitism bureaucracy into apoplexy. Why? The reason is that the party's anti-splitism bureaucracy functions as one vast vested interest. China's fight against separatism commands a force of at least 400,000 cadres - drawn from the party, government and army - whose careers flourish or founder on how well they wage war against separatists. The case of Hu Jintao, the former president, is a clear precedent. His decisive clampdown when party chief in Tibet on protests that rocked the area in 1988 and the imposition of martial law in Lhasa set the stage for how the party would behave when student protests shook Beijing in 1989. Hu was assured a spot in the politburo in the following years to become China's top leader. Any reconciliation between the Dalai Lama and Beijing would make the careers of those involved in the anti-separatist struggle go up in smoke. These people live on anti-separatism, are promoted due to anti-separatism, and they hit the jackpot by anti-separatism ... The longer the Dalai Lama keeps on staying abroad, and the bigger his influence, the more long-lasting the period of high ranks and great wealth for those anti-separatist groups ... On the contrary, when the Dalai Lama restores relations with the Central Government, these people will be terrified, tense and lose their jobs. President Xi Jinping is in the best position to overhaul China's hardline Tibet policy. He is untainted by any heavy-handed crackdown on Tibetan protests. For him to develop a robust and healthy Tibet policy that leads to reconciliation between the Tibetan people and Beijing, he needs to first overcome internal bureaucratic resistance and inertia. NOTE-- Thubten Samphel is the director of the Tibet Policy Institute, a research centre of the Central Tibetan Administration based in Dharamsala, India. He is perhaps the strongest pro-Tibetan autonomy writer and one of the greatest assets of Central Tibetan Administration when it comes to responding to Chinese writings attacking the exile Tibetans including the Dalai Lama. And the above article is initially published by Asian Times Online.